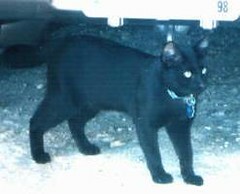 Mugoddai, the cat, has been missing since December 2003. Maxine Hillary, who works on food safety at the U.S. Department of Agriculture, has not given up on finding her Mugoddai. Hillary has spent almost $4,000 in newspaper ads, pet detectives, animal communicators, infrared cameras, a laminating machine, and bilingual mass mailings. She has followed numerous leads, checks in with animal shelters monthly, and even did a three-hour stakeout to find her beloved cat. She has a website that is devoted to her cat, still puts up posters on telephone poles, drops off flyers at shelters, and looks through online lists of found cats. To me, this is not about having a cat; it’s about finding the one cat that I nurtured and loved since before his eyes opened. I found myself walking around at 3 in the morning in the snow looking for him. Part of me said, ‘This is crazy,’ the other half said, ‘Your pet is lost in a strange neighborhood.’ He’s my responsibility. This entry was posted on Wednesday, June 6th, 2007 at 2:59 pm	and is filed under Cats, National Dog, Cat & Pet Info, News for Cats, Dogs & Owners. You can follow any responses to this entry through the RSS 2.0 feed. Both comments and pings are currently closed. I totally understand, I would do the same and never give up. I have a cat that I am “momma” to also. Nurtured her since she was just a few days old and I would be devastated to lose her. Neighbors around here think I am crazy cause if she gets out I will be up half the night calling her to come in. What can I say? I have done this and would do it again in a heartbeat. Luckily, I have had a happy ending to my pet searches. My heart goes out to this woman and her beloved cat. Standing in the freezing cold, canvassing an entire neighborhood, putting up posters, talking to everyone passing by, calling area vets, internet, you name it, yes, I’ve done this even for a feral cat I had adopted just a few months prior. I moved one time and three of our birth cats came up missing. We found one after two weeks of intense searching. He had a broken pelvis and dislocated hind leg. He’s still with me and is now almost eleven. We never found the other two and I still ache for them after ten years. My heart goes out to you and I pray you find your Mugoddai. I’ve seen stories in the news of dogs and cats who are miraculously returned to their family as many as ten years later. Pray for God to send angels to him to show him the way home. Even ten years later, I still keep hope alive that at least my two babies were taken in by someone as kind and loving as I am. A true friend never forgets. My heart goes out to you. I lost three cats over the years. Two were found near my home. I search for a year doing some of the things you did and then had to move away. But my heart aches for that little darling I called Bunny, even after 8 years. Will never stop missing her. However, I give my love to the two I have left. Several years ago, a tornado wiped out a small town in my state. A kitty was missing. Two,maybe three years later, this kitty was found and reunited with its parents. If only more pet owners were this committed to their pets! There would be no more need for animal shelters! My little Scarlett was lost half a day after she sneaked out and I searched until it was too dark to see. The emptiness was horrible. The joy when I saw her on the road was immeasurable. Please, keep them inside and keep them safe. Road traffic and psycho neighbours are no way for a precious friend to die. And don’t forget diseases they can pick up from other free-roaming cats, and being mauled to death by free-roaming dogs. All of this happens every day and when it happens to you, you’ll realize it just wasn’t worth it to believe that cats need outdoor freedom. Her cat was not microchipped. The article talks about it but doesn’t make enough of a big deal about how pet owners should get their pets chipped. Itchmo, too, buries the lead. The story should be more about microchipping. Thanks for the encouragement. I’ve received plenty of nasty comments too. Seems there are those out there who think I’m crazy, mentally ill, a pathetic, lonely person–quite the opposite. I’ve got so many balls in the air I can barely find time to eat! The article was wonderful, but a couple of comments might be taken a little out of context. I have fewer than 25 flyers up in the neighborhood at this point. I don’t want to anger the neighborhood. It doesn’t take much to keep your shelter notified or to do a mailing once a year. I put less than one hour a month into my search at this time because it’s pretty automatic. I am happy to share everything I’ve done and I know for a fact that the things I have shared with other missing pet people have brought cats home. Again, thank you everyone for your encouragement.